" It seems just like yesterday that we spent some very happy days in your "Cottage" by the river, on the occasion of our Granddaughters 21st--3rd of this month. Just to say "Thank you" for the comfort of your cottage for a family gathering from far & near & a very special thank you to the log fire!! HOW that was enjoyed--even better after we turned the heating off!!! So, yes, we had a really happy time & thoroughly enjoyed ourselves & trust you found the place left as we found it--perfect." " The Inn is beautiful with such attention to detail -the food, the ambiance...perfection!" " Again, a truly impeccable stay. I stay here when I am working away from home and it still feels like home! Every detail is perfect. The service is incredible and I wouldn't stay anywhere else." "Thank you again for a wonderful, relaxing, pampered weekend. It just keeps getting better! -we'll be back!" "Fantastic Inn, wonderful people, delicious meals. A true home-away-from-home! Your the TOPS in my book! Thank you!" " Your B&B has such warmth and best of all a wonderful breakfast and sound sleep. Thank you for the hospitality." " It is lovely to see your beautiful gardens from this room!" "As often as I am on the road for my job, your B&B is such a truly unique and rare experience. Thank you for all you do!" "I travel to Rochester at least once a month, after having stayed at the chains downtown - I would never go back! The food, the ambiance, and the special attention to details and your guests needs is truly amazing!" 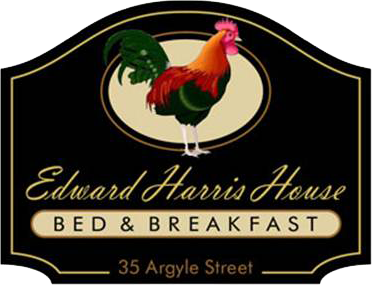 I want to receive emails, updates, and newsletters from A B&B at The Edward Harris House Inn.